TheRealMayanProphecies.com » News » Asteroid near-miss an ominous sign for the future? 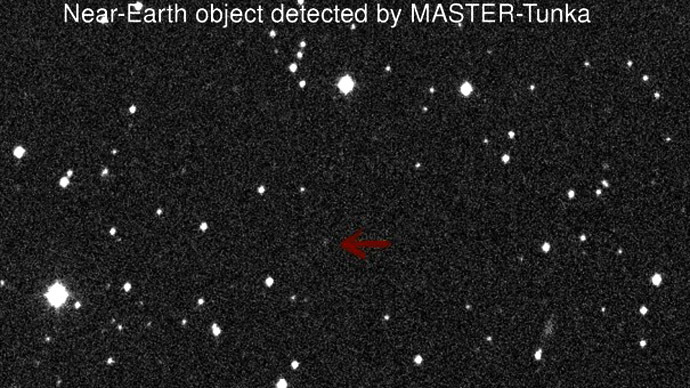 October 2nd, 2013 | Comments Off on Asteroid near-miss an ominous sign for the future? This weekend Russian scientists reported Earth barely escaped an impact with a fast-moving asteroid. According to Vladimir Lipunov of the Moscow State University and the Sternberg Astronomical Institute, “[The asteroid] was discovered on Friday night by our station near Lake Baikal and nine hours later it flew within 11,300km of the Earth’s surface, below the orbit of geostationary satellites. It was about 15 meters in size.” This is the same size as the meteor which exploded over the Russian city of Chelyabinsk earlier this year. Unfortunately, it was only detected less than nine hours before it could have impacted Earth, not enough time to prepare for such an event. Worse still scientists have since lost track of the asteroid. This is part of a pattern which has seen an increase in eyewitness accounts of meteor fireballs over the past year. September saw the most eye-witness reports of meteor fireballs in a single month since records were started, according to the American Meteor Society (AMS). Fireballs are simply what astronomers call particularly bright and long-lasting meteors. Unlike typical meteors or falling stars which are no bigger than a grain of sand, fireballs are caused by space debris ranging in size from a baseball to a basketball burning up in the atmosphere. Seventeen such eye-witnessed fireball events have been registered with the AMS in September, the most ever reported in a single month. A massive fireball was spotted over Atlanta this weekend and two fireballs were reported on successive nights in the Midwest last week. Over a thousand spectators watching a University of Alabama football game witnessed the most recent fireball as it streaked across the sky casting a brilliant green glow. What’s to account for such an increase in these fireball events? Is it merely a coincidence or part of a worrying new pattern? Back in 1984 British astrophysicist Victor Clube and astronomer Bill Napier predicted that Earth would experience an increase in such events starting after the year 2000 as the result of Earth passing through a debris field left over from an ancient comet that broke apart thousands of years ago. According to the book Mayan Calendar Prophecies: Predictions for 2012-2052, ancient Mayan astronomers made the same prediction but pinpointed the time period with much more accuracy believing the increase would come after December 21, 2012, the so-called “end” of the Mayan calendar. Unfortunately for the citizens of Chelbyinsk, Russia Firestone’s 2004 prediction that these large objects would “most likely miss us” was not borne out when on February, 15, 2013 one such piece of debris exploded over their city. Coincidentally, this event occurred just over a month and a half after the Mayan calendar end-date. According to the book Mayan Calendar Prophecies, the Maya did not believe anything of any importance would occur on the exact end-date of their calendar, despite the sensationalist media accounts to the contrary. Instead, this “end date” marked the end of a 5,000 year cycle that saw little danger from impact events and marked the beginning of a new cycle where such risks from space would increase. The best metaphor one could use is that of a typical hurricane. As the outer bands of the storm pass over they bring with them light sprinkles. But as one enters the center of the storm the rainfall increases dramatically. Currently we are in the outer bands of the meteor storm predicted by Napier and Clube. Over the next 400 years these scientists expect Earth to pass through the densest parts of the meteor storm resulting in a higher risk of a devastating impact event. Unfortunately, the Maya believed the threat from space would come sooner. According to their predictions, serious impact events could be expected for the twenty-year time period between 2032-2052. That’s only 19 years away! Whatever the future may hold one thing is certain: October always sees an even greater increase in fireballs due to the arrival of the Taurid meteor shower. So keep your eyes pointed to the sky for your chance to witness one of nature’s best light shows.